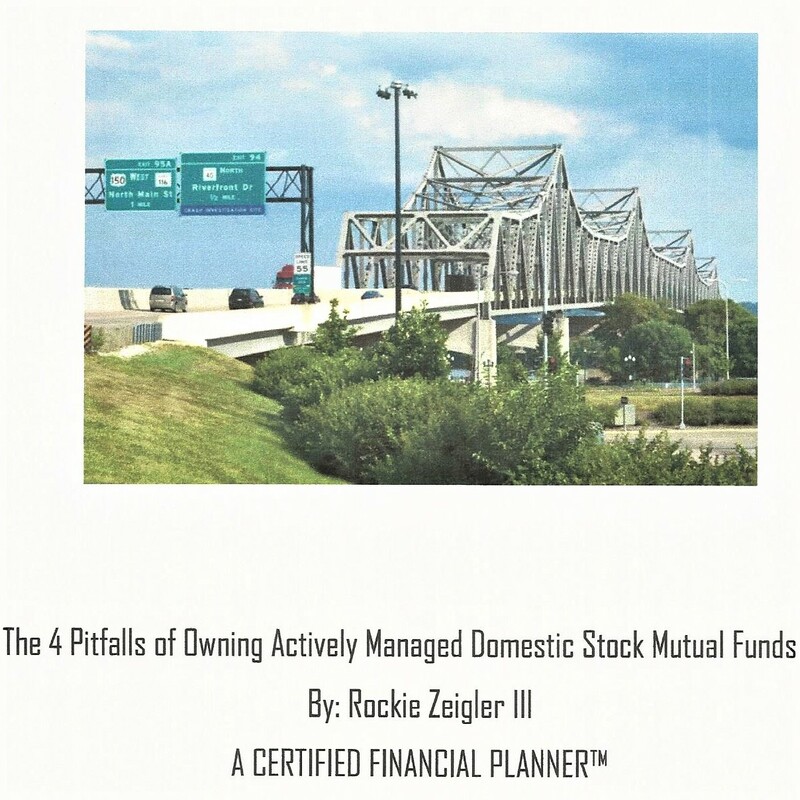 Asset Management & Financial Planning For Assets Managed by RP Zeigler Investment Services, Inc.
Fees include investment management and all the financial planning topics mentioned above. A face to face, ongoing personal relationship with a CERTIFIED FINANCIAL PLANNER ™ professional. A written financial plan addressing all of your financial concerns. We will also cover financial planning basics such as emergency funds, estate planning, tax planning, retirement planning, risk management and investment management. Ongoing communication with the firm. Whether it's a phone call, an email, an in-person meeting, a video conference, or social media direct message, we will be in regular contact with you. If you call us, we will call you back. if you email us, we will email you back. While we cannot control the economy or the stock markets, we are able to control our level of commitment to you. Asset allocation advice for your employer sponsored retirement plan such as a 401(k) or 403(b) not managed by RP Zeigler Investment Services, Inc. Advice on 401(k) vs ROTH(k). Please make note: The scope of financial planning and investment management will be tailored to each individual situation and will depend on the needs of each client/household. RP Zeigler Investment Services, Inc. nor any of its employees serves as a tax professional, estate planning attorney or tax attorney. Neither RP Zeigler Investment Services, Inc. or any if its employees prepares tax returns or estate planning documents. RP Zeigler Investment Services, Inc. is a Registered Investment Adviser offering advisory services in the State of Illinois and in other jurisdictions where exempted. Registration does not imply a certain level of skill or training. The presence of this website on the Internet shall not be directly or indirectly interpreted as a solicitation of investment advisory services to persons of another jurisdiction unless otherwise permitted by statute. Follow-up or individualized responses to consumers in a particular state by RP Zeigler Investment Services, Inc. in the rendering of personalized investment advice for compensation shall not be made without our first complying with jurisdiction requirements or pursuant an applicable state exemption. All written content on this site is for information purposes only. Opinions expressed herein are solely those of RP Zeigler investment Services, Inc. unless otherwise specifically cited. Material presented is believed to be from reliable sources and no representations are made by our firm as to another parties’ informational accuracy or completeness. All information or ideas provided should be discussed in detail with an advisor, accountant or legal counsel prior to implementation. The information on this site is provided “AS IS” and without warranties of any kind either express or implied. To the fullest extent permissible pursuant to applicable laws, RP Zeigler Investment Services, Inc. disclaims all warranties, express or implied, including, but not limited to, implied warranties of merchantability, non-infringement and suitability for a particular purpose. RP Zeigler Investment Services, Inc. does not warrant that the information will be free from error. None of the information provided on this website is intended as investment, tax, accounting or legal advice, as an offer or solicitation of an offer to buy or sell, or as an endorsement of any company, security, fund, or other securities or non-securities offering. The information should not be relied upon for purposes of transacting securities or other investments. Your use of the information is at your sole risk. Under no circumstances shall RP Zeigler Investment Services, Inc. be liable for any direct, indirect, special or consequential damages that result from the use of, or the inability to use, the materials in this site, even if RP Zeigler Investment Services, Inc. or a RP Zeigler Investment Services, Inc. authorized representative has been advised of the possibility of such damages. In no event shall RP Zeigler Investment Services, Inc. have any liability to you for damages, losses and causes of action for accessing this site. Information on this website should not be considered a solicitation to buy, an offer to sell, or a recommendation of any security in any jurisdiction where such offer, solicitation, or recommendation would be unlawful or unauthorized.